A.J. Keys and M.A.J. Parry, Ribulose Bisphosphate Carboxylase/Oxygenase and Carbonic Anhydrase. R.C. Leegood, Enzymes of the Calvin Cycle. A.R. Ashton, J.N. Burnell, R.T. Furbank, C.L.D. Jenkins, and M.D. Hatch, The Enzymes of C4 Photosynthesis. L. Copeland, Enzymes of Sucrose Metabolism. M. Stitt, Fructose 2, 6-Bisphosphate. A.M. Smith, Enzymes of Starch Synthesis. M. Steup, Starch Degrading Enzymes. R.D. Blackwell, A.J.S. Murray, and P.J. Lea, Enzymes of the Photorespiratory Carbon Pathway. W.C. Plaxton, Glycolysis. D.D. Randall and J.A. Miernyk, The Mitochondrial Pyruvate Dehydrogenase Complex. J.L. Harwood, M.C. Walsh, and K.A. Walker, Enzymes of Fatty Acid Synthesis. A.H.C. Huang, Enzymes of Lipid Degradation. T.S. Moore, Jr., Enzymes of Phospholipid Synthesis. J.L. Wray and R.J. Fido, Nitrate Reductase and Nitrite Reductase. P.J. Lea, R.D. Blackwell, F.-L. Chen, and U. Hecht, The Enzymes of Ammonia Assimilation. R.J. Ireland and K.W. Joy, Aminotransferases. K.W. Joy and R.J. Ireland, Enzymes of Asparagine Metabolism. P.L.R. Bonner and P.J. Lea, Enzymes of Lysine Synthesis. S.E. Rognes, Threonine Biosynthesis. R.M. Wallsgrove, Enzymes of Leucine, Valine and Isoleucine Biosynthesis. D. Schmutz, C. Brunold, M. Suter, C. Von Arb, A. Schmidt, S. Klapheck, H. Rennenberg, and J.T. Madison, Sulphur Metabolism. A.M. 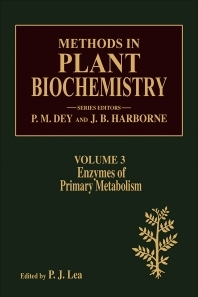 The series Methods in Plant Biochemistry provides an authoritative reference on current techniques in the various fields of plant biochemical research. Each volume in the series will, under the expert guidance of a guest editor, deal with a particular group of plant compounds. The historical background and current, most useful methods of analysis are described. Detailed discussions of the protocols and suitability of each technique are included. Case treatments, diagrams, chemical structures, reference data, and properties will be featured along with a full list of references to the specialist literature. **Conceived as a practical comparison to The Biochemistry of Plants, edited by P.K. Stumpf and E.E. Conn, no plant biochemical laboratory can afford to be without this comprehensive and up-to-date reference source. Postgraduate and research-level physiologists and biochemists, laboratories, and libraries, and industrial users.